Have you ever noticed that the fancier the restaurant, the less food there is on your plate? My husband and I went on one of our very rare visits to a chic restaurant last night. Koriander is its name, and it’s in a particularly ugly section of the small city of Drachten, in Friesland. Once inside, though, it’s a roomy, calm, quiet space, with white linen-draped tables set well apart for privacy. It’s tastefully decorated, mostly in white with accents of black. The quick, attentive service was perfect: no one hovered over us. As for the food, let me start by saying that it was consistently delicious. 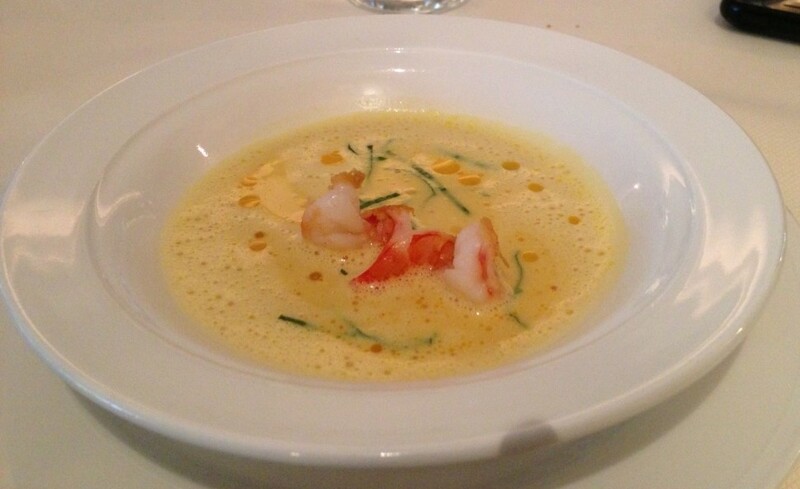 Koriander has had a Michelin star, after all, since 1999. But that’s not what I wanted to talk about. This is the second starred restaurant Albert and I have visited – the other was Frouckje State in Rijperkerk (now called Eleve and moved to Leeuwarden) — and we’ve noticed some things about this sort of restaurant. Food is served in tiny quantities on very large plates. When I say tiny, I mean sometimes a single mouthful. This doesn’t mean you go hungry if you eat there, because the small size of the portions is compensated for by the sheer number of courses. 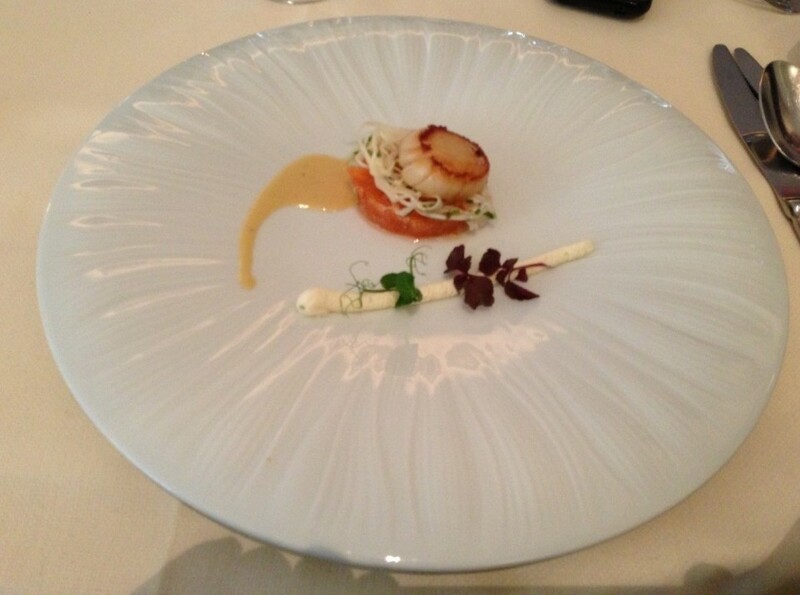 Take, for example, our second course (above): the large plate held precisely one scallop, resting on a bed of cabbage and smoked salmon. That white thing you see in front of it is some sort of sauce. It was tasty, but I don’t know what it was. It looked like it had been squeezed out of a toothpaste tube. The scallop was cooked to perfection. So was the smoked salmon, which made up about two mouthfuls. But when something is delicious, don’t you want more? Here’s another example: course number three (above). This was a white carrot soup, if I remember correctly, with some sort of spice combination that I couldn’t identify, but the spices complemented each other beautifully. Notice that there is just one shrimp in the middle. Just one. And it’s not even floating; there’s not enough of the soup for it to float. Course number four was a small piece of white fish on a spoonful of ratatouille. This course was less impressive than the others, in terms of flavor. That’s another thing: they pile the food up. Are they trying to make it look even smaller? The sixth course (above) was what I think could be considered the main course, and it did have more food on it than the other courses, but the dish it was served on was even larger. It was an absolutely sublime duck steak. So what is the point of the large plates? Is it to make us think we’re getting even less food than we are? How does that translate to charging us more for it? 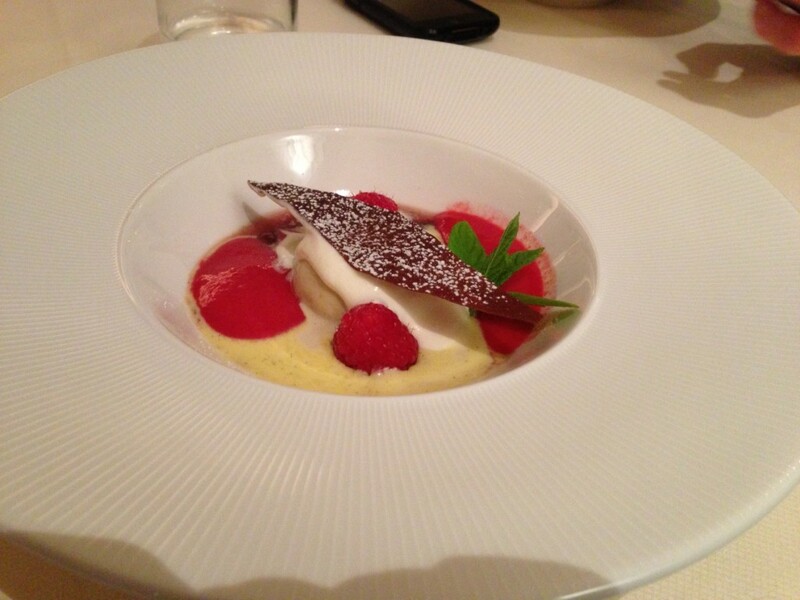 The other thing we noticed at both the Michelin-starred restaurants we’ve visited is the preponderance of foam. Dishes are served with foam. I don’t know why top chefs feel the need to foam so many ingredients. Is it because of the texture? It is indeed pleasant to eat, and you don’t even have to bother to chew. Or perhaps it’s because it allows them to use even less of the given ingredient, but to charge more for it? Here’s an example in the photo above: this was our first course. 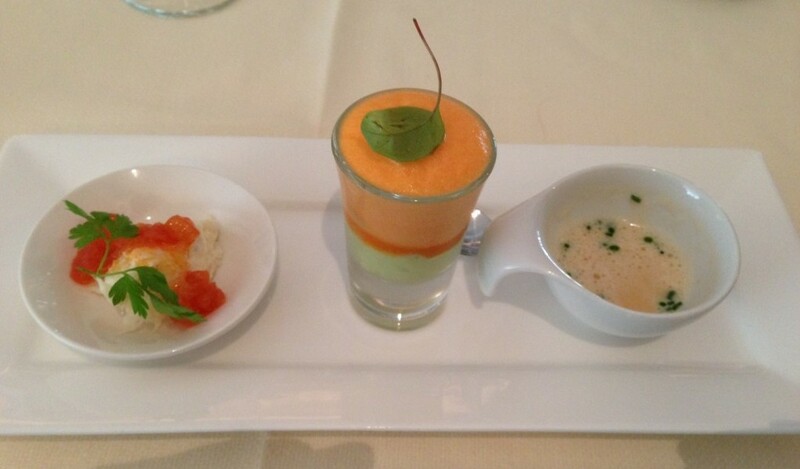 That middle item has pureed peas at the bottom and carrot foam on top. Foam made of carrots? Really? Again, I’m not criticizing the flavor; it was as delicious as all of the courses that followed. But what’s this fascination with foam all about? This course (the fifth, I think) had foam too (left). It’s apparently called “Spoom,” and is used to “cleanse the palate.” It seemed to be a combination of melon sherbet and champagne. The top was foam that tasted more like melon than champagne. At least in this case the foam seemed more like it fit here; after all, a good piña colada will also have foam on top. Dessert (photo below) was a delicious combination of items: the small (of course!) scoop of ice cream under that crispy cookie is coriander-flavored. That probably sounds awful, but it was scrumptious, especially with the raspberries and whatever that white sauce was. Again, note the size of the bowl; this isn’t particularly comfortable if you’re trying to keep your chin over the bowl to avoid dripping. In total, we had seven courses, if you don’t count the tea afterwards, which was accompanied by mouthwateringly good chocolates. And we could have had more; we turned down a cheese course before the dessert. What it all comes down to, of course, is excellent food, combined with pretentiousness. Frouckje State, the other starred restaurant we’ve visited, was distinctly heavier on the pretentiousness scale. There, a big effort was made to arrange the silverware – reset for each course – in their own particular unique way, in which the fork was balanced on the knife just so. They made quite a show of it, as if it mattered! I’m curious to try a two or three-starred restaurant next. I wonder if the pretentiousness factor would (or could) be even higher. I wonder if they foam their food as well, and if they pile it in the middle of huge plates. And I wonder how high the prices could possibly be. I’d love to hear if you’ve been to any starred restaurants that don’t do these things. 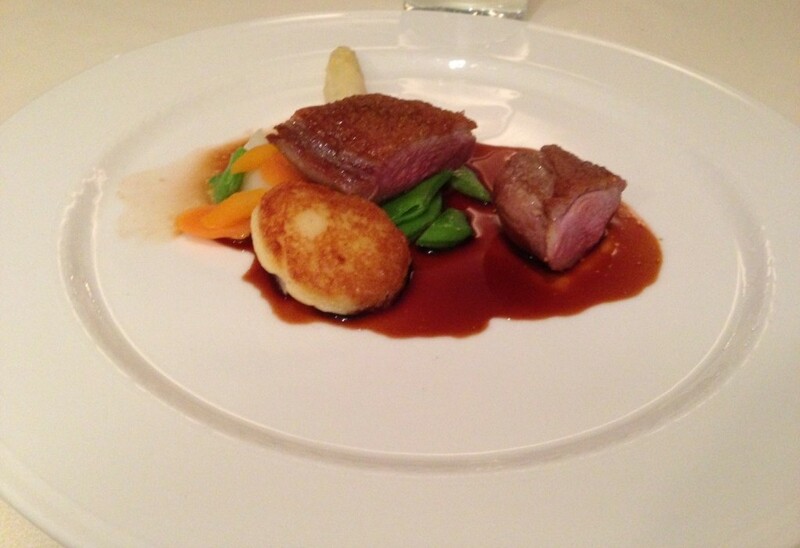 Or if you’ve been to any two or three-starred restaurants, I’d like to hear how they compare! My husband & I rarely go to fancy restaurants. The few times that we have, my husband especially, we have not been impressed. I guess we just like the simpler fare! I go to fancy restaurants only on special occasion and I love it! Precisely when you tell me Rachel about this small portions, I like it even more!